In a phone conversation with Iran’s Deputy Permanent Representative to the United Nations, Es’hagh Al Habib on Tuesday, Maria Luiza Viotti, the Chef de Cabinet to the UN chief, offered Guterres’ deep regret over the devastation and expressed his readiness to establish any cooperation and offer any contribution to aid efforts to the flood-hit people. Viotti also underlined that any humanitarian aid should be exempted from any sanctions on Iran and said it goes without saying that humanitarian aid must be excluded from any restrictions imposed by the sanctions, a report by Fars news agency said. For his part, the Iranian official expressed the Islamic Republic’s gratitude for the UN chief’s message and said through unity and synergy, the government and nation of Iran have used whatever in their power to cope with the natural disaster. “It goes without saying that the Islamic Republic will welcome any help and support from the international community. But, the illegal and unilateral sanctions imposed by the US on Iran have impeded humanitarian aid flow from related international bodies,” he said. Therefore, he added, the UN should step in and put an end to the impediment through appropriate measures. The message of Guterres comes as he is now on an official visit to the Middle East. Earlier, the Iranian foreign minister warned against the impacts of the US sanctions on relief operations in flood-hit areas and said Washington’s anti-Iran sanctions are hampering delivery of much-needed relief equipment to flood-hit areas in Iran. In a tweet, Mohammad Javad Zarif accused the United States of flouting the UN Security Council Resolution 2231. Zarif condemned the US blocking of the Iranian Red Crescent Society’s aid efforts as “financial terrorism”. The United Nations Office for the Coordination of Humanitarian Affairs has also said that challenges caused by Washington’s unilateral sanctions will affect its relief support to Iran. 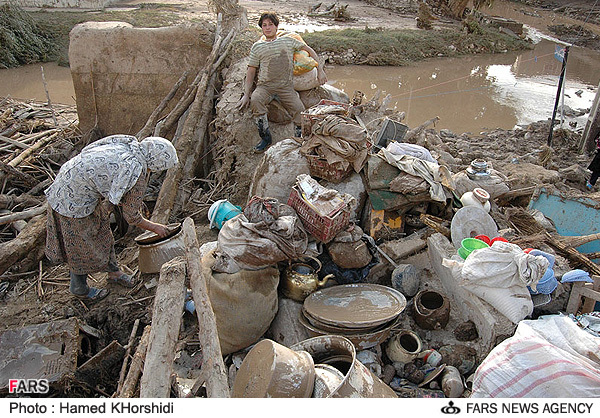 Relief operations are underway in flood-hit areas in Iran. So far, over 60 people have lost their lives since the floods hit Iran since March 17.